I actually had a site bookmarked for this very reason that provided some good, sound advice. I've always heard that a cougar (mountain lion) generally doesn't let you see it unless its considering attacking. Avoid rapid movements, running, loud, excited talk. Stay in groups; keep children with adults. Probability of risk is slight, provided your response is appropriate. Hold small children; keep older children close to an adult. Look for sticks, rocks or other weapons and keep them at hand. Watch the cat at all times. Probability of attack is slight for adults given proper response. Probability of attack is serious for unaccompanied children. All of the above steps, plus place older children behind adults. Seek a safer location, or one above the lion, if available. Appear larger. Raise arms, objects, or jackets above your head. Probability of attack is substantial. Take all the above actions. 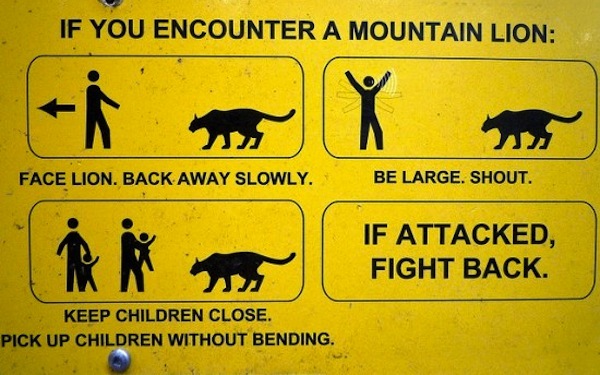 Moving slowly, position trees, boulders or other large objects between yourself and the lion. Do not lose sight of the lion. Smile! Show your teeth. (A woman attacked at Cuyamaca Rancho State Park may have saved herself by baring her teeth, growling and staring the lion down as it approached her). Make loud, menacing sounds, like yelling and growling. Throw things if the lion is close enough to hit. Use lethal weapons if you have them. Pepper spray may be effective if lion is downwind and close enough. Probability of risk is serious if within 20 yards. Use a stick to charge the lion, thrusting the stick toward its face. No stick? Yell loud and run toward the lion with arms high. Stay beyond striking distance of its paws. This video is quite a good instruction. But beware! This strategy might not be valid for other beasts of prey, such as lions. In a video which is now deleted, a man is instructed to be quiet and stay low not to agitate the beast. Also, the man in this video is staying low (in fact, he's almost lying) and threatening the lion with toilet paper (!) if necessary. Not the answer you're looking for? Browse other questions tagged hiking canada cougars or ask your own question. Are there any possible telltale signs along a water's edge that it would be a good spot for gold panning?